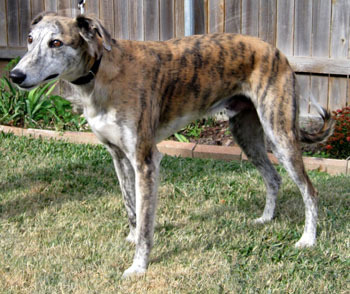 Bud is an approximately 2-year-old brindle male found as a stray in Midland, TX. Bud and Piper were found together in an oil rig yard outside of town by an employee. Temporary lodging was found for them, and several days later Marian Jones, GALT's West Texas Rep, transferred them to Dr. Wick Culp's clinic in Amarillo. 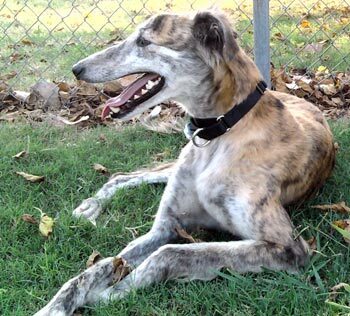 Bud arrived with a positive titer to Ehrlichia. He received successful treatment with his titer dropping two dilutions. 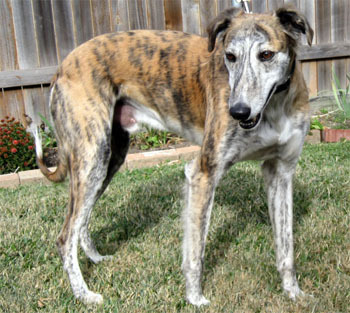 He is a handsome and very affectionate boy, and he is ready to find his forever home!!! Bud gets along with smaller dogs, but is not cat tolerant. Bud is an adorable boy! He is very affectionate and likes to give kisses. 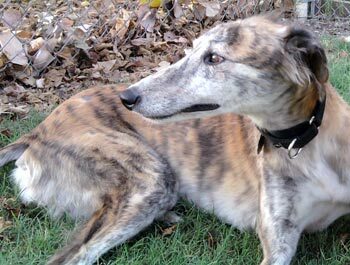 He likes running in the back yard, and will also take a time out to sunbathe in the cool weather. He has not chewed on anything inappropriate has not tried to counter-surf. He rode nicely in the car to his first meet & greet. I'm working on his leash manners, and he is already pulling less after just a few outings. I have had Bud in his crate up to 4 hours while I am at work and he has done very well. He likes to sleep in his crate with the door open at night or on one of the dog pillows in my room with my two senior grey girls. My dogs have enjoyed running with Bud in the backyard and they are all getting along wonderfully. I'm in no danger of sleeping too late - Bud's happily thumping tail is a good alarm clock! He has a gorgeous sit, and I'm going to try to teach him to sit on command since he does it so nicely on his own. Bud will make a great buddy to a family who wants a beautiful, bouncy, bundle of joy!